We haven't had the heavy snow that's affected some areas of Britain over Easter - our holiday was just wet. And everything has stayed... damp. The weather didn't stop the kids having an Easter egg hunt in the garden, but it was perishing as well as soggy, and their poor little hands were all red with cold. These papier mache bunnies, in the shop in St. Martins-in-the-Fields' Crypt, (which I think I've mentioned before) were more my style, even though they were made of papier mache so you couldn't even eat them. You only have to look at them to see they come from a hot, bright, flowery place. and had a relaxed Easter - inside. We've been feeling the lack of exercise, though. First, being stuck inside for weeks because we were both ill with this bug earlier in the year, and now because the weather has been so uncongenial that it hasn't seemed like an attractive prospect to be out all day. Yesterday, though, we took the tube up to Kingsbury, which is on the Jubilee underground line. We'd never been to this suburb, and wanted to see what kind of a place it was, and perhaps explore the small country park nearby if the rain held off for an hour or two. It turned out to be a pleasant multi ethnic area with a a good selection of curry houses, Indian sweetshops and truly mega food-supermarkets selling food from all over the world. The country park was accessed from a suburban street, and just as well we bought waterproof hiking boots. 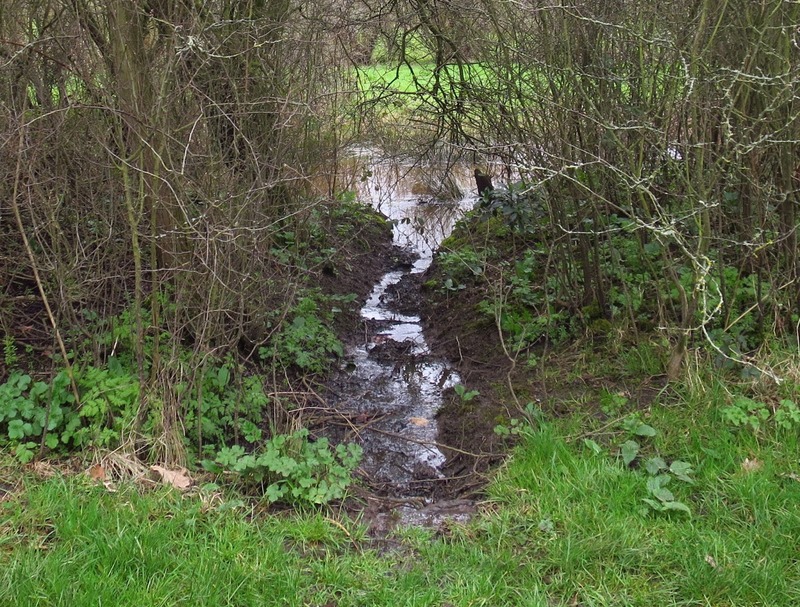 The ground was like a bog - no, this is not a stream, below. 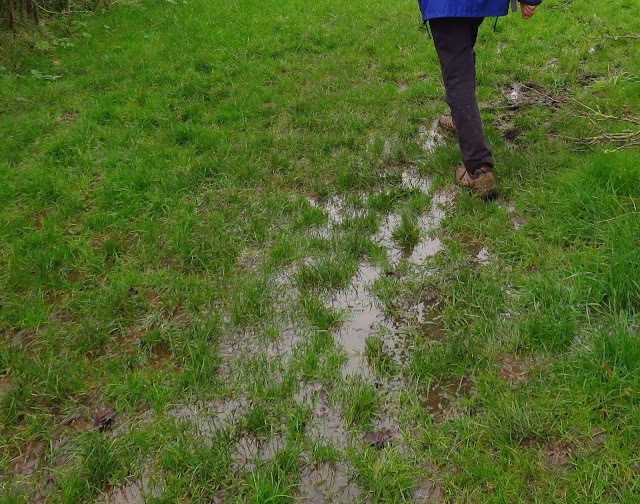 Walking was a matter of stepping from tuft to tuft of grass and avoiding as much water as possible. Yet it was worth going. The area was obviously once farmland, and consists of woods and small fields divided by thick thorn hedges and hedgerow trees. 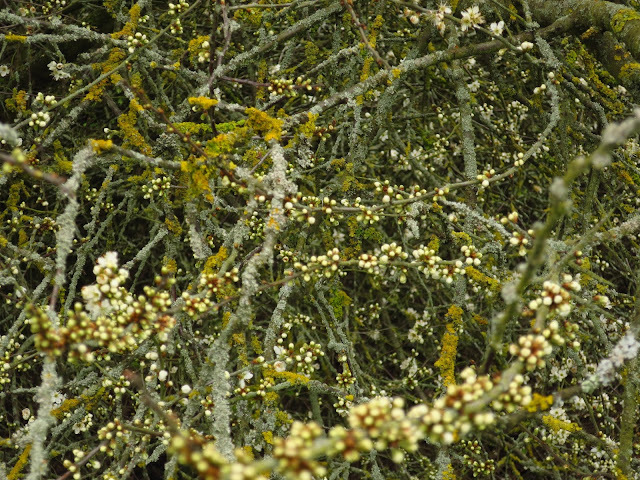 The hedges didn't look at all interesting at first, being entirely leafless, but if you went close up and looked inside them, they were wonderful. 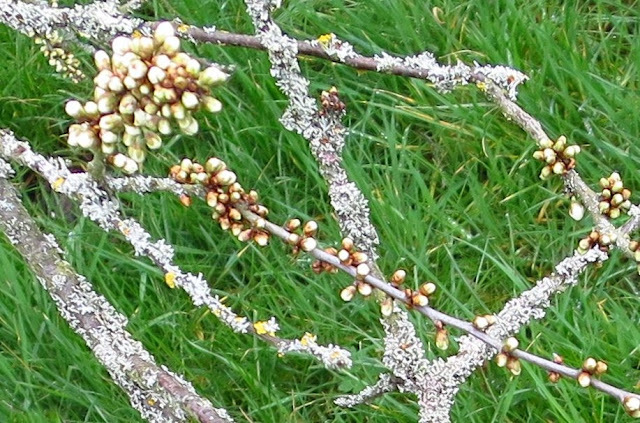 Everything is very late this year, but the different coloured buds, mosses and lichens and the mass of twigs created a wondrous effect like a great intricate embroidery. or what looked almost like pieces of jewellery. Some parts of the hedgerow were like an ocean of life, with each part ready to go. On the way back to the tube, the suburban gardens, by contrast, were neatly tended and stocked with garden plants in bright colours. My eye was taken by this dinosaur scene - the dinosaurs are arranged in an artfully created little valley of rock and vegetation. I like to think of someone having fun creating it. We have a small field in East Anglia which we generally let out for grazing, but the farmer emailed yesterday suggesting it might be a while before he brought his cows along this spring, and sent a photo by way of explanation. I've never seen the land flood before, but it really looks as if it could support a few ducks at the moment, doesn't it? Footpath=Wetpath. It has been a winter of excesses. Oh my goodness so much water. Love the bunnies but the sweet blue bunny on the top right hand corner has the best expression. I think they must all be hand painted and that's why they have such different expressions. Great photos! Lots of rain here well. Colder than normal. We had a heatwave briefly and now back to cold and wet..
Life flourishes even in the wet and cold, it finds a way, and here a beautiful way. Hope you dry out a bit soon! I have even noticed that there are fewer pet cats roaming around than usual. They don't like it either! Getting out into nature is such a balm to the soul. I'm glad you chanced it and took these pictures to share with us. And I have to say- the dinosaurs especially charmed me. That is so totally a thing I would do. The weather has certainly been in extremes, hasn't it? I try not to think about the reasons. I find it impossible but am so grateful for everything which blooms and seems to indicate at least some form of continuity. I am always delighted to see Spring and the land waking up again, no matter what the weather. But I do hope it improves soon so I can get out and enjoy it in comfort! You are much ahead of us wrt spring flowers, and it's as miserable as sin here today: rain, sleet, hail and prodigious winds. Your second photo brings me back to my childhood when the only eggs I remember having were boiled. We were still under heavy British influence on both sides of the family. I probably haven't had a boiled egg for at least three decades although my wife and grandson will munch on a hard-boiled one on occasion. I can barely look for some odd reason. But I'm fine with fried and scram,bled. Weird, eh? Oh, yes, I am so glad I don't live in the days when you had to wrap bits of sacking round yourself or tie on hanks of straw! Must have been so hard to walk apart from anything else! Oh yikes, Jenny. Yes, that IS a damp Easter! But I'm glad you could have the egg hunt nonetheless and I love the ones you bought at the St. Martin's shop. Your day trip looks a bit soggy but what beautiful blooms. We had snow last night. No buds on trees. The spring I thought was here (silly me) evaporated. And rain is predicted later this week. The weather is on a warpath this year! Yes, like you, I thought Spring or even summer was here when we had the warmest April day since 1949 last week. It's all gone now, used itself up in a couple of days. Surely it will return, eh? It's still cold and inclement here, too. Snow flaked down today, but didn't linger. It looks like you are finally getting your spring. I gather that the area is usually much drier, but in Ohio, where there is a lot of melting snow and spring rains, many fields, lawns and woods become marshy like this--it is just part of the season. People who go out to gather maple sap about now, who must traverse the spring woods, learn the value of good waterproof boots. It always seems okay when it is normal and to be expected. It is not to be honest totally unknown to have wet spring times and the wildlife and vegetation are both quite used to it. In fact, they might even like it, up to a point. Lovely, if wet...Best to you! Love the colorful animals. I feel that the bluebells, weirdly, are a bit early this year. I'm sure they don't generally come out till May. But perhaps that burst of sunshine last week lured them out too early! Well done on braving the weather to erect a pergola. I hope you soon have some sunny days to go and sit and grow plants in it. Hope it hasn't overflowed yet! I thought we were through with all that last weekend... oh well! Here, over the past fortnight or so not a day and/or night has gone by that we've not received some rain. It has been predicted to clear away tomorrow or the following day. My Easter was spent very lazily...purposely. I love those paper mache bunnies...how beautiful they are. I suppose autumn is on its way to you now, and perhaps that is a relief as I understand it can get pretty hot in your part of the world, even though it also looks fabulous there too. Hedges are great habitats for plants and animals alike, and your photos show an unusual perspective. There are many "jewels" on my cherry tree, too, but it will probably take at least another week until they unfold and turn the tree into a beautiful white cloud. We're in for a really WARM weekend, they say, reaching at least 21 Celsius on Sunday - I can't wait! We had that last weekend, and it was terrific. Just a bit of hot sun can make such a lot of difference, and it was interesting to see how quickly the leaves unfurled. It was a visible change between the morning and evening on the first day. OMGosh! Wet-wet-wet! Love the unexpected dinosaurs. We had the possibility of snow mentioned on the weather but I don't believe I have known it as late as May. However my mother in law in her youth took a bet that it wouldn't snow in May and it did, so I am not 100 percent confident it won't happen again! Love your photos and your travels. We are in the midst of major flooding so you can imagine how much it must be raining here! We had a few days of very hot weather and it really did feel like midsummer so I do not feel quite so hard done by as I might have done. It's nice to see everything budding and about to burst forth! Your egg cups are fun. Perfect for Easter. I love the bright colors and designs of the bunnies in the shop! There have been times so far this year we've had a surplus of rain here, too, but no bad flooding. This week we drove to my husband's hometown 120 miles away from our home. We passed flooded fields all along the interstate and one closed road due to high water, but no displaced people or destroyed homes. We'll be dry before the summer's over so we enjoy the rain while we can. I enjoyed your detailed photos of the natural world of the park you visited. Great eye to capture the beauty of "not quite spring." I'm glad you enjoyed the pictures, Teresa. It is strange that in so many places the weather is unseasonably wet for the time of year. I would enjoy rain more if I knew we would have a dry summer but that is not necessarily so. Precious tradition, here in some places it is still done, the eggs are painted in Easter of beautiful colors, but we do not have that precious habit of the children catching Easter rabbits in the gardens. It's costing spring to arrive, it keeps a strange idyll with the winter and in the first days it has snowed and well, now it's still raining but you have to walk and go for a walk, whatever you do. A huge hug and a happy weekend for you and yours. I don't know where the fad for having Easter bunnies or eggs came from. They don't seem to have anything to do with the traditional view of Easter. Maybe I haven't studied the subject enough! Much rain here for two or three days, no surprise there is flooding. I naively thought that summer might be on its way last week. Ho hum. I'd love to buy something new to wear ... I seem to have lived in this thick jumper for years... but can't ever imagine it'll get warm enough to buy the pale pastel teeshirts in the shops at the moment. Time to knit a shawl, perhaps. 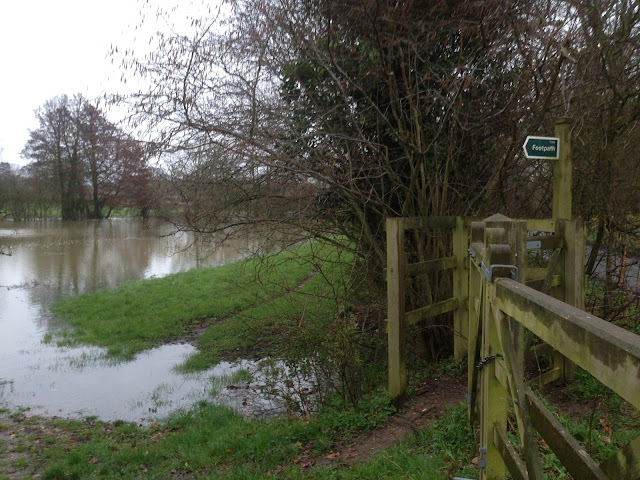 I like the optimistic sign "Footpath" pointing to the huge unexpected lake. And I like the splendid chicken eggcup. As you say, nature is providing some wonderful displays even though so many plants and flowers are slow-growing because of the miserable spring. I confess to never having heard of Kingsbury. I had to look it up. Given the fact that I spent quite a lot of time in that general area I feel quite ashamed of myself. I'd never been there either. My rule of thumb is, if you have lived near a place for years and never hear anything about it, there's probably not much there that is worth going to. Having said this, I'm hearing more about Willesden recently, so perhaps it's time to pay a visit. Apparently for years I had been shunning dingy, cramped, suburban, boring West Hampstead because I just couldn't go to bear there unless I had a good reason... and now I discover that during my absence it has transformed into a "hip and aspirational" place full of chic restaurants. Talk about being knocked over with a feather. So maybe Willesden will surprise me too. A soggy but lovely walk. It's wet here, too, but that's just helping everything to look lush. I agree that the lushness makes up for the dampness - up to a point. Super photographs....but how wet it all is! I am hoping the plants are grateful. In reality all that has actually happened is that my camellia has died through being waterlogged and some tulip bulbs have rotted.... hm. We're having the exact opposite weather here. Winter is usually the dry season, but this year it's been unusually dry - so much so that some wildfires have already popped up. We were all happy to see some rain last weekend and again this evening. It seems almost impossible that I'd be glad to see rain right now, but I have felt that way sometimes in very dry summers. The plants do love it. Wet weather but spring is in your place Jenny. 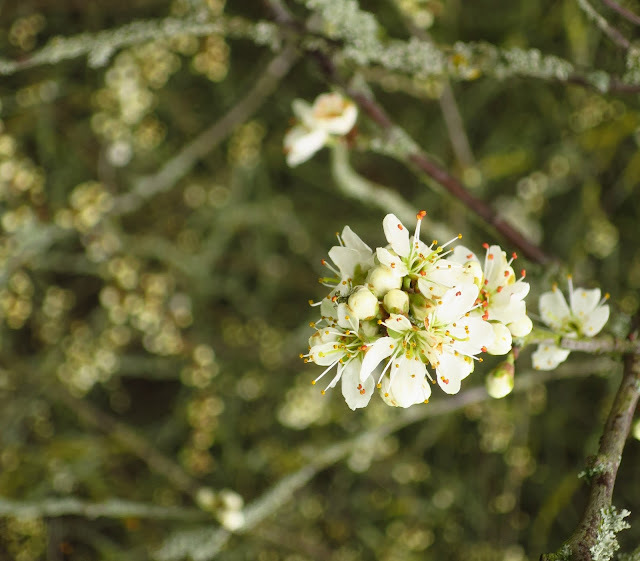 I love your photos of first flowers, sprouts and buds, it's such touching. 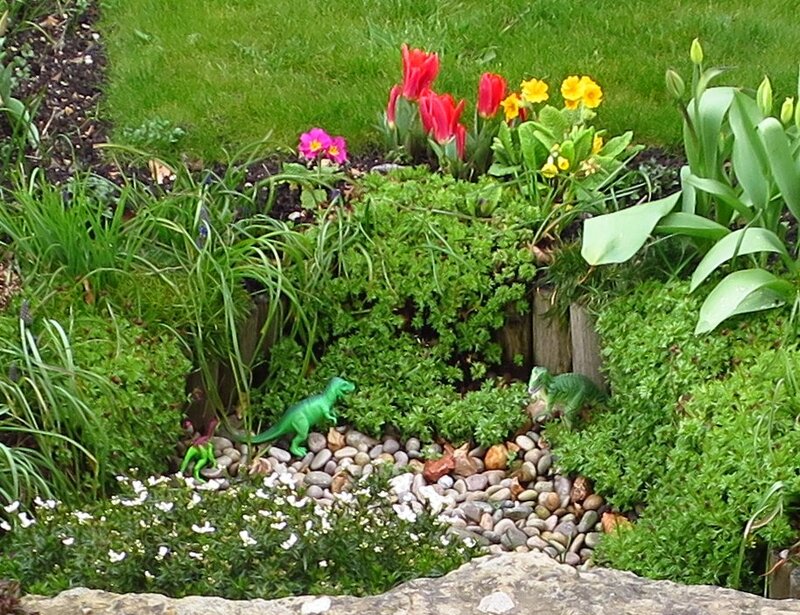 Soon I'll seen all these in my garden that is freed off snow. I agree- everything is late this spring. You have such a long winter but I always enjoy your posts of indoor flowers during the times when plants are dormant. A gardener always has plenty to do in preparation even in the winter. Hello Jenny, what a lovely Easter post, and oops, I missed it. Those bunnies are gorgeous and I'd love them in my collection. As for the woods, how beautiful, I love the Northern Springtime! Great post. I am glad that spring lasts for several months here, I know that in some places it's a mere couple of weeks. this is great that in spite of odds created by weather you were able to celebrate a happy Easter with family inside the house ! Isn't it amazing that anyhow you took trip to this wet though but lovely area dear Jenny! yes the carnation of nature in the woods filled soul with joy and gratitude ,this sounds a wonderful world in the world we live ! thank you for beautiful photos ,though it must be hard to walk but still i can imagine the enthusiasm of having outing in such weather . Oh, I would not like temperatures of 40 degrees no matter what the season! I hope you have good air conditioning. Dear Jenny - The papier mache bunnies look like made of ceramic and the patterns look Japanese. I treasure that egg-cup and Y likes to be served an egg on it. 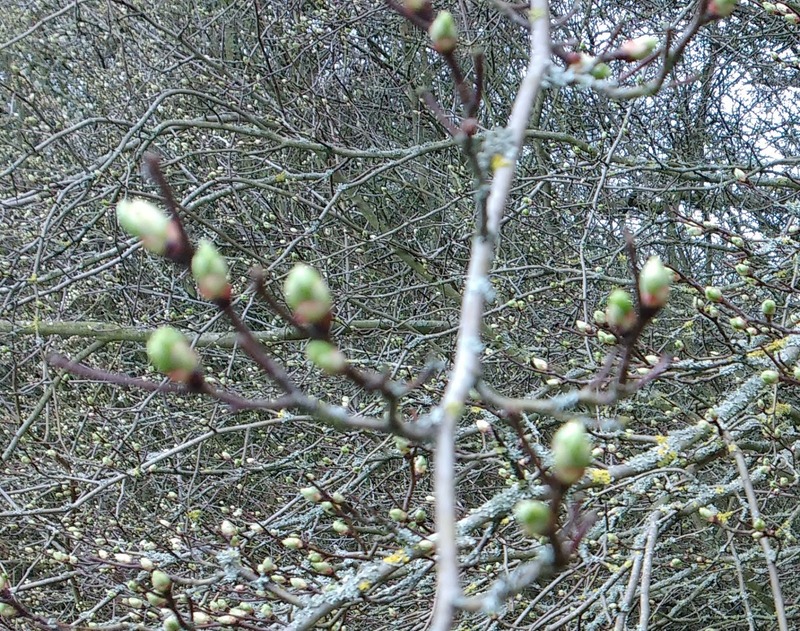 To see the photos from the country park in Kingsbury, the current state of your spring is like our mid-March. We have been blessed with unusually warm, sunny days, though chill air returned with vengeance a few days ago. Now it’s warming up again. The temperature difference like a roller-coaster has brought “spring exhaustion” to some people. Back to the country park, the soggy land shows how the weather has been there. Photos are eloquent. Wish you warm, sunny days of spring sooner. Sounds interesting. I'd forgotten how interesting it is to just wander round selected bits of London. Not just London, but so many other parts of England. It's been a far wetter spring than we've had for a long time. It's still my favourite season though. Mine too, for all its faults. I'm amazed someone hasn't stolen the dinosaurs by now. I hope you had a good Easter, sorry I'm here so late on but I was in the States, so I'm only just catching up with commenting on blogs. I hope you are enjoying the slightly milder dry weather now! Thank you - I'm glad to have discovered your blog too. So sorry that you are not feeling hundred percent. All the best! There was a fad for quaint and comical egg cups in the 1930s, and my mother made a little collection of them. This is why I have quite a few. My grass is underwater like that. No cows, though. Jenny, I don't know how I missed this post - but just wanted you to know that I'm finally here. I REALLY like those papier mache bunnies, and the cute chick egg cups are perfect for Easter breakfast. After enduring the coldest April I can ever remember, it's finally starting to warm up here in the Tennessee wilderness. Your latest post of the spring trees and flowers was beautiful, Jon. What a soggy season! I think you’ve had it worse than we have. So sorry you haven’t felt well, Jenny, but I’m glad you got out and about. Lovely photos! Still soggy but I am feeling better anyway! Jenny, we have had the same weather here as spring has come late this year. We are finally having scenes like you are having and flowers and trees are popping out all over. The world needs spring and we must savor every minute of it. Squishy springtime! The sun is here, sometimes for as long as five minutes! Everyone goes nuts, putting up lawn chairs, sitting for about three minutes, then collapse lawn chairs, and go back in by the stove, satisfied! Two dinosaurs successfully changed the one meter space to the ancient paradise. That is a good appreciation! Hello Jenny, I'm on a catchup! 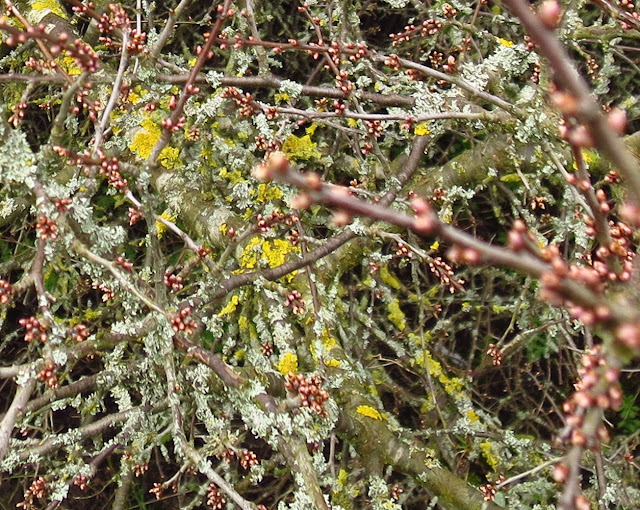 Loved the look through the hedgerow too.